The month of October opened with the 18th Infantry Regiment preparing to leave its defensive position in the damp forest South of Aachen, Germany. After many long hours of planning and careful preparation this Unit was being released to play a major roll in a grand scale offensive which was to culminate in the surrender of the famous fortress city and the complete destruction of its determined defenders. Commencing at 1300, 2 October, 1944, two Battalions of the 1106th Combat Engineer Group took over the positions so long held by our troops and the Regiment, less the 3rd Battalion, was brought back to a bivouac area two miles behind the lines. Here they took up the task of reorganizing and preparing for the future operation. The troops were cleaned and rested and the limited recreational facilities afforded a front line division were placed at their disposal. At the same time staffs busied themselves over the integral planning for the next big move. The 18th Combat Team was to move to an assembly area East of Aachen and attack to the North; the ultimate objective being a low rolling ridge line lying to the North of the city which dominated all movement in and around the city proper. This ridge, named Crucifix Hill by our troops because of the crucifix standing on its highest point, was strongly organized by the enemy; studded with pillboxes and fortifications all along its 1000 yard length. The enemy, too, was well prepared for a last ditch stand knowing that, if this key terrain feature fell, Aachen was doomed. The "Big Plan" called for the 18th Infantry to seize Verlautenheide and Crucifix Hill and to join up with the American XIX Corps who were pushing South from positions North and East of Aachen. With this accomplished the vital supply lines leading to the city from the East would be cut; Aachen's Garrison isolated. It was then the plan to tender the commandant of the garrison an opportunity to surrender. If this was refused the city was to be reduced to a rubble by bombing and artillery and the 26th Infantry Regiment was to swing left into the city, from positions on the rim, and force a capitulation. The plan was enormous and depended upon so many phases that each minute detail had to be carried out to perfection. The 18th's role in this quick, mighty thrust was to be as follows; After a one hour’s artillery preparation on known enemy targets the 2nd Battalion, 18th Infantry, was to attack through the 16th Infantry's left company position and seize the village of Verlautenheide. Upon the consolidation of this objective, the 1st Battalion was to pass through the 2nd Battalion, attack and seize the dominating ridge line North of Verlautenheide, inclusive of Crucifix Hill, and organize the ground for all around defense. At the same time the Weiden-Haaren Road was to be cut by fire and its use as an escape or reinforcement route for the forces in Aachen denied to the enemy. The 3rd Battalion, 18th lnfantry, then was to jump off from its position South of Verlautenheide and seize Hill 192, a ridge which extended from Aachen North to Crucifix Hill, thus diverting partial attention of the enemy from Crucifix Hill. This whole plan was tremendous and depended wholly upon accurate timing and perfect coordination. The terrain over which the troops were to pass offered little or no cover and was under direct observation of the enemy. The movement had to be exercised with a maximum of rapidity utilizing to the utmost the element of surprise. It was to be a frontal attack, straight thru the center of the line; a line covered with pillboxes filled with determined enemy. Therefore, everything was afforded the main to give him the maximum amount of support. An air-ground liaison officer was to accompany each Battalion who could call on supporting aircraft from anywhere in our sector. In addition to our supporting tanks, 155 Self-propelled guns were on hand to be brought into action with direct fire on any difficult targets that may appear. 11 Battalions of Field Artillery were poised to fire supporting fires at the beck and call of the artillery forward observers with our forward elements. Within the Battalions assault teams were organized armed with pole charges, satchel charges, flame throwers, beehives, and bangalore torpedoes. It was only after all these minute details were complete that "Zero Hour" was set. The attack was set for the early morning of October 8, 1944. At 2000 hours, on the evening of 7 October the Regiment closed in its assigned assembly area in the vicinity of Brand, Germany. At midnight, 7-8 October the 1st and 2nd Battalions marched to their forward assembly areas in the vicinity of Eilendorf. At 0400 the 2nd Battalion jumped off, and after a bitter struggle gained its objective at about 0700 and proceeded to "mop-up" Enemy artillery and mortar fire, however, was intense and the Battalion suffered considerable casualties. The 1st Battalion crossed their line of departure at 0900, moved through the 2nd Battalion under the heavy enemy barrage, stirred up by the seizing of Verlautenheide, and pushed toward its objective. 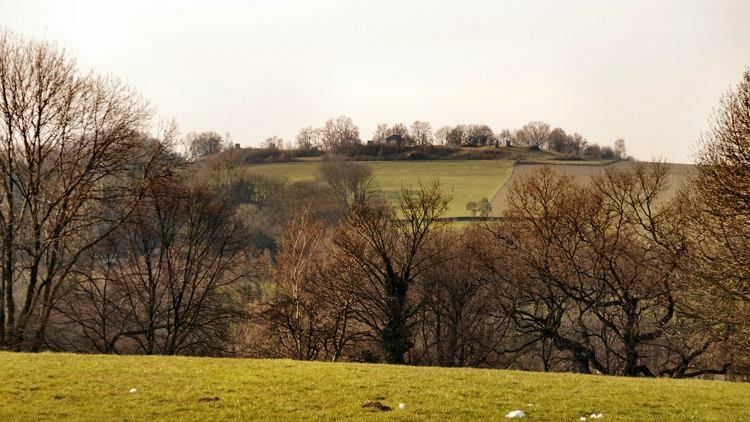 Pillbox after pillbox fell to our determined attackers and at 1630, 8 October, Crucifix Hill and its ridge was ours. While the 1st and 2nd Battalions were pressing their attack the 3rd Battalion was probing in and around Haaren with patrols to determine the enemy strength prior to their offensive. The Battalion jumped off at 1300 and within two hours, after a lightening like move, were on their objective. At daybreak, 9 October, enemy artillery and mortar fire began falling on all three of our objectives. Soon afterwards the enemy attacked all three positions; the 1st and 2nd Battalions catching the brunt of the attack facing approximately a battalion each; the 3rd Battalion catching infiltrations from the numerous pillboxes confronting their objective. All three attacks were repelled with many casualties inflicted upon the enemy and many prisoners taken. 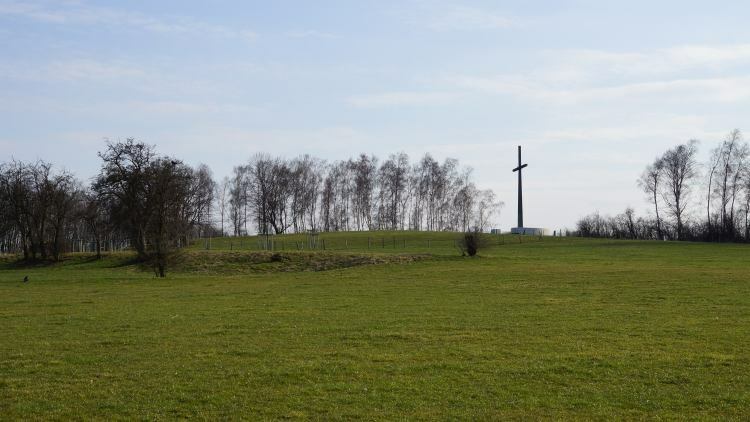 On the evening of 9 October, "I" Company was attached to the 1st Battalion and, with Company "B", were ordered to seize Ravelsberg, a prominent hill 1500 yards Northeast of Crucifix Hill. The attack operated so smoothly that within a few hours the objective was taken without a fight. The force was ordered to avert a fight, if possible, and this was accomplished. Though handicapped by darkness, pillbox after pillbox was by-passed and the objective was reached. This move climaxed the encirclement of Aachen. The main supply routes were cut and the enemy garrison new had only the choice of fighting the 26th Infantry or attempting a breakthrough our lines. The latter was tried several times, before their backs were forced against the wall, but at all times failed. On 11 and 12 October several small scale attacks were launched against our positions but were staved off with the enemy suffering many casualties. However, the Battalions continued, throughout this harassing, to strengthen their positions in preparation for any larger scale offensive the enemy might undertake. On 12 October, a composite Company, consisting of the I & R Platoon of Regimental Headquarters Company, the Mine Platoon of Anti-Tank Company, and the Reconnaissance Platoon of Company "B", 634th T.D. Battalion, was brought into the 3rd Battalion defensive position to strengthen their left flank. Although the Regimental Objectives had been gained and secured there were still many pillboxes within the area that were in enemy hands and had to be reduced to give us full command of the area. From the 12-18 October this was undertaken and accomplished. Patrols from Company "K" finally made physical contact with patrols from the 119th Infantry on the North and the encirclement of Aachen was completed. On the 19th of October, "K" Company, on Ravelsberg (Ravels Hill), was attacked, by a superior enemy force supported by tanks, who apparently had been given the mission of regaining the important height, dominating the escape route out of Aachen, and relieving the besieged garrison. A bitter fight ensued. After withstanding wave upon wave of enemy infantry they were finally forced to give some ground. "B" Company, acting as Regimental Reserve, was rushed to their assistance and together they counter-attacked. The ground lost was once more regained and the enemy given a terrific beating. Many prisoners were taken and the battleground was strewn with enemy dead. It was this decisive defeat that decided for the enemy that our positions were too strong for them to pierce and for the rest of the month they stood off and licked their wounds, probing our positions with patrols. At 1205, 21st of October, the garrison of Aachen finally surrendered to the 26th Infantry. With all escape gaps plugged, they had been driven to the West end of the city and pounded with Artillery and fighter bombers. Their cause was hopeless and they had no other alternative. From the 19th to the 31st, enemy infantry activity in the Regimental Sector was light. Patrol contacts were numerous but not on a large scale. However, enemy artillery and mortar fire during this period was the most intense ever experienced by this Regiment in its two years of Combat. Regardless of this the Companies continued to strengthen their positions with mines and wire and ready themselves far any future counter-move the enemy might undertake. Even with the bitterness of fighting there was a brighter side. Rest centers which had been established in the rear, were utilized for officers and men. 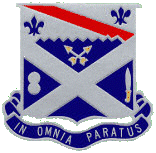 At 2200, 23 October, the 2nd Battalion was relieved by a Battalion of the 26th Infantry and brought back to a reserve position in the vicinity of the Haaren factory district. From that date, throughout the month, Battalions were shifted every six days to give each Battalion a three day "breather". The troops were given every available opportunity to clean house and keep fit. The month of October was an eventful one for the 18th Infantry. It had experienced some of its toughest fighting of the War and won for itself a fame that will go down in the annals of the glorious history of the "Fighting First".